Hi guys! We're halfway through the week, and I hope yours has been going well. It's been business as usual around here, and I'm not complaining at all. 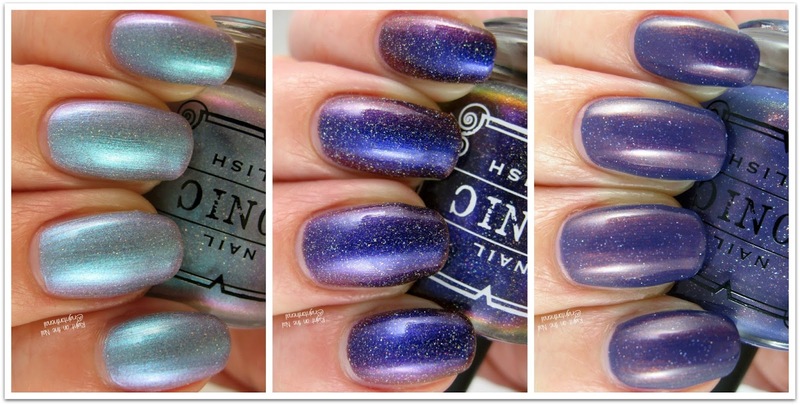 Tonight I have the final 3 polishes from the Tonic Nail Polish holiday collection. I think it will be hard to top the first 3 colors I posted on Monday, but let's just see how these measure up. Shall we proceed? I mentioned this on Monday's post, but I wanted to make sure to add this information here as well. There has been some debate on whether or not the formula is too thick on these polishes. Personally, I found all of them to be a bit too thick for my taste. This doesn't mean that they were unmanageable, but I found it a lot easier after adding a few drops of thinner. Several other bloggers have stated that they found the formula to be perfect, so YMMV. Up first we have Luminescent which is a light blue with flashes of pink and gold with a scattered holographic finish. This one was insanely hard to photograph because the pink really stood out in person and is subtle in my pictures. This was my second favorite from the collection...mostly because it just glows on the nail. It needed 3 coats for full opacity, and I added some thinner to it to get thinner coats (so that my nails would dry in a timely manner). Magnetic Midnight is a deep navy base with flashes of purple and gold with silver holo glitter and a scattered holographic finish. Whew, some of these descriptions are a mouthful, right? The blue and purple are the most prominent colors, and the gold pretty much shows up at extreme angles. Pictures show 2 coats of thinned polish. Stars at Twilight is slightly different than the rest of the collection. Instead of being a true duo/multichrome polish, it's more of a creme polish with some interesting shimmer. It's a medium dusky blue base with red to gold shimmer with a scattered holographic finish. I feel like a broken record, but I really like this one as well. I can't help myself! I thought Stars at Twilight applied better than the rest of the collection and I could have gotten away without adding thinner. Again, pictures show 2 coats of polish. You guys know I don't often buy whole collections. I don't have the money to spend, and I'm always on the lookout for new indies to try. That said, I'm super happy I bought the whole collection. If you can't get them all, my recommendations would be Dragon Tears, Luminescent, and Stars at Twilight. Again, Lindsey is currently closed, but will be reopening soon. You will also be able to find some Tonic polishes at stockists like Color4Nails and Rainbow Connection with some site exclusives. You can find out more information about Tonic on their Etsy, Instagram, and Facebook Group pages.